There's nothing more annoying than that last little bit of Windex that won't come. 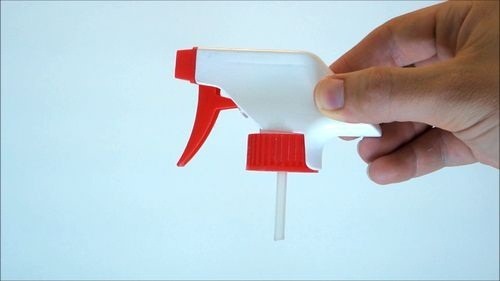 Most spray bottles are horribly designed, with the suction tube usually the culprit, but you can replace it and have a spray bottle that works in any position in about five minutes. Cut the suction tube connected to the spray bottle to about one inch. 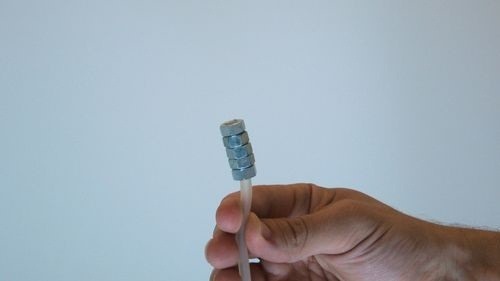 Cut the flexible tube to about one inch longer than the piece that you removed. 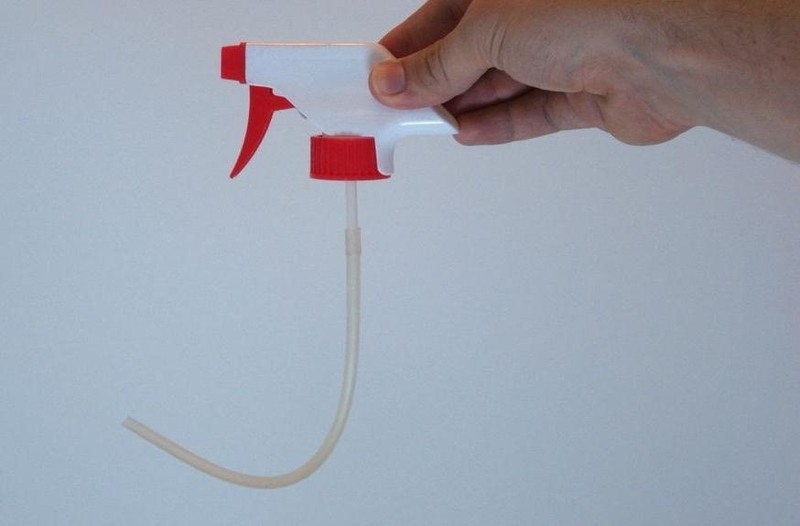 Fit the flexible tube over the one attached to the spray bottle. Attach the weights to the end of the tube. You can use glue if they don't fit perfectly. The weights will ensure that the opening of the tube is always submerged in liquid, so you can spray from any position. 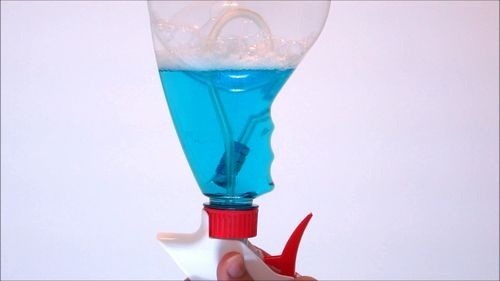 You'd be amazed at all the things you can do with a spray bottle, like turn it into a handheld misting fan to beat the summer heat, or even a mini flamethrower. But sometimes the best thing is just fixing flaws for a better version, like this spray-at-any-angle bottle. Check out the original tutorial by DIYHacksAndHowTos. 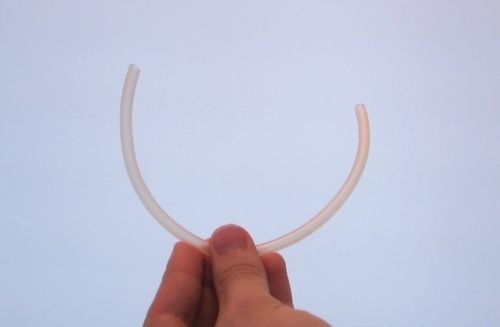 So, um... where does one actually GET small lengths of soft, flexible, clear, 1/8-inch plastic tubing? I know I can order spools of 25 feet, but what would I ever do with the remaining 24+ feet? 1/8 inch is too skinny for almost anything else I'd use flexible tubing for. My local hardware store and big-box (Lowes, Home Despot) reno stores don't have. As it happens, I have a treadmill that needs belt lubrication. The silicone belt lube comes in 4-ounce (118ml) pump-spray bottles. The belt is thick and strong and can be raised only about 1-1/2 inches near the middle of the bed. The side rails (or whatever you call the frame pieces alongside the belt) are several inches wide, so an upright pump bottle must be held several inches away from the belt, inviting getting silicone spritz on the frame/rail (wasted), or on top of the belt (wasted and messy) and not reaching anywhere near the middle of the treadmill bed under the belt. So, all I'm doing is lubing the outer left and right thirds of my treadmill belt, at best, wasting some fluid that lands too early, and never reaching the middle third of the belt. Not optimal. I am absolutely certain that the people who sell the lubricant know the limitations and produced that bottle type deliberately, so they could sell more fluid.... and also colluding with the treadmill makers who get to sell more treadmills when they don't get properly lubed. But then, I'm just cynical. Great simple fix--I will have to try this! Another spray bottle problem I have figured out is how to get a standard stream-only spray bottle to actually spray. The problem is that the inside of the nozzle isn't making contact with the spray head, even when fully tightened. Unscrew and remove the spray nozzle. Cut a piece of clear vinyl to just fit inside the nozzle. Insert the vinyl piece into the nozzle. Use a narrow awl or large pin to poke a hole that lines up with the nozzle opening. Screw the nozzle back on all the way and test. If it still isn't creating a mist, try a thicker material or another layer. Mine isn't perfect, but much better!